There is plenty about life in Delhi that I failed to anticipate when I arrived to live in the city eight years ago. Among the most annoying is the menace of monkeys. More specifically, the rhesus monkey, a feral creature with plenty of confidence and – more frighteningly – a stubborn intelligence to torment all but the most zealous animal-lover. As luck would have it, I have just such an animal-lover living across the road from me. While she scatters chapatis about her balcony for the benefit of the local monkey troop, so the rest of the neighbourhood must hope her simian friends don’t decide to roam in search of tastier fare. I have, on more than one such occasion, failed to keep the doors of my apartment firmly shut and discovered monkeys helping themselves to the contents of my fridge. Shouting at them doesn’t help. In fact, unless you have a stick or start throwing shoes at them, rhesus monkeys seem to consider humans more a distraction than a threat. A couple of years ago, Delhi’s deputy mayor S.S. Bajwa died when he fell from the terrace of his home after a gang of particularly ferocious rhesus monkeys attacked him. The only means to avert such tragic encounters appears to be securing the services of a langur monkey. And this is precisely the solution employed by British High Commissioner in India. I don’t make a habit of visiting the High Commission but a few years ago I found myself relaxing on the ample lawn of the residence when I noticed a short man approaching me. Strolling alongside him was a monkey tied to a leash. As the man got closer, I realised that his companion was almost the same height as he was. This monkey was very different from the small rhesus variety that I had seen menacing my neighbourhood. Instead of the ubiquitous limp and incessant scratching that seem to be the curse of all rhesus monkeys, this creature walked with an elegant gait and wore a beautiful grey fur coat that appeared entirely fitting given the opulent surroundings. As this langour monkey lunched on the leaves of a nearby bush, I ventured a stroke and asked it’s owner what had brought the two of them to the High Commission. The man explained that he and his langur were employed to take a daily stroll around the gardens so as to ward off a local gang of rhesus monkeys. Apparently the mere sight of a langur is enough to deter the most determined rhesus monkey. It was amply clear that the langurs were forcing the rhesus to disperse and move to newer localities. This led to monkeys visiting places where they had not been found earlier. So, while the British High Commissioner is able to enjoy afternoon tea sans-monkey on the lawn of his residence, it may be those of us living in less salubrious areas of town who are paying the price of his privilege. The two photographs in this post were taken eighteen months ago while I worked on a story about tigers for the recently folded National Geographic Adventure magazine. 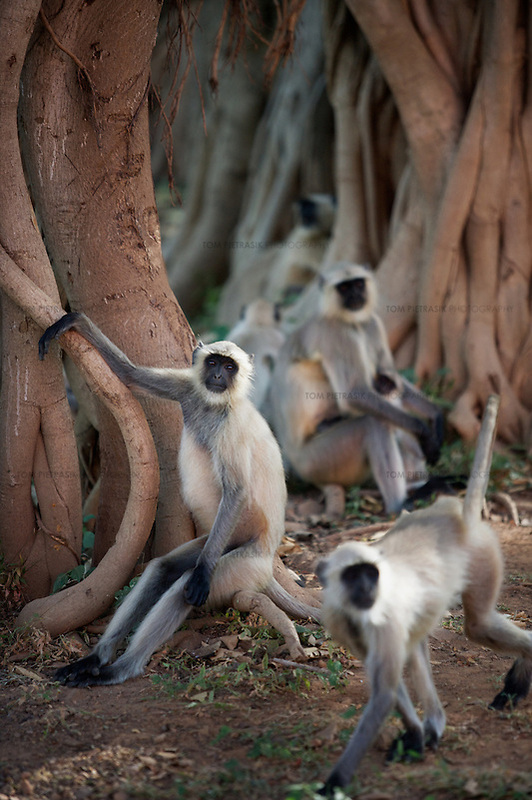 My most memorable encounter with langur monkeys on that occasion was beneath the canopy of a huge banyan tree in Ranthambore National Park, Rajasthan. 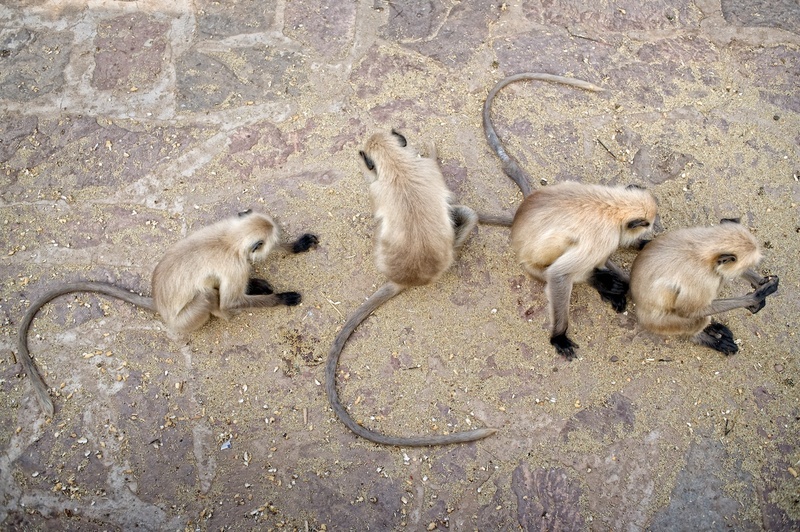 A group of about thirty langurs of various sizes had gathered there to play, groom and, I suppose, just catch up. It was a privilege to witness such an idilic scene and I was completely captivated by these sociable creatures, their behavior so reminiscent of humans. an interesting story – i recall my uncle’s son being bitten by a monkey in delhi as a child, we had to rush anti rabies medication for him. btw, where did you stay when you visited ranthambhore? I just read a fascinating article on rabies over at Ramani’s Fieldnotes blog. As Ramani describes, rabies is a serious threat, particularly in rural India where it seems that treatment can only be secured with access to money – or conscientious and persistent friends. As for hotels in Ranthambore, we stayed at The Tiger Safari Resort, one of those non-descript hotels with a friendly staff but nothing much else to recommend it. tom, this is very well written, and i enjoyed reading it. i remember in vellore in the ’80s monkeys used to regularly raid the women’s hostel – they would come into the room if the door was open, and help themselves to snacks. the most difficult to evict, however, were the ones that got on to the dresser and sat there admiring themselves in the mirror. Admiring themselves in the mirror! I think the evolution vs. intelligent design debate is over. What more proof do we need? Monkeys and humans must share a common ancestor!